Collette Moreno was a beaming 26-year-old looking forward to her upcoming wedding in Jamaica when her life ended on a two-lane street as she and her best friend attempted to reach her bachelorette party. A weekend bachelorette party in Missouri ended before it began when the bride-to-be was killed in a tragic car accident, just minutes after snapping a selfie with her best friend, police said. The accident occurred Friday, when Collette Moreno and Ashley Theobald, both 26, were driving to the Lake of the Ozarks for Moreno's bachelorette party. Theobald was driving a 2013 Chevy Malibu on Missouri Highway 5, when she attempted to pass another vehicle on the two-lane road, according to the Missouri State Highway Patrol. In an interview with Kansas City's WDAF-TV, Theobald said she was passing a semi-truck because it was emitting a lot of exhaust fumes, which were causing Moreno to cough. "She has really bad asthma … and she was coughing, so I was like, 'OK, we have to pass,'" Theobald told WDAF. It was while passing, police say, that a man driving a 1999 Dodge Ram pickup from the opposite direction came over the crest of a hill and struck the passenger side of the Malibu, sending the car veering off the left side of the road. Theobald, who was not only Moreno's best friend, but also her maid of honor, sustained only minor injuries from the crash. She initially thought Moreno would also be OK.
"I was talking to her," Theobald said. "She couldn't talk back but she was nodding at me. I didn't know it was as bad as it was because she wasn't physically super beaten-up." Melvin Garber, the 25-year-old driver of the pickup, was not seriously injured in the crash, police said. Theobald was transported to a local hospital where she was treated and released. Moreno, who was wearing her seat belt, was not as lucky. Emergency responders transported the young woman to University Hospital in Columbia, where she was pronounced dead. A cause of death has not yet been released. 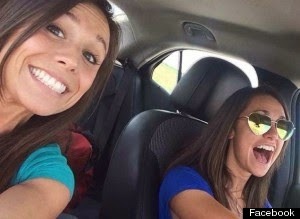 Just eight minutes before the crash, Moreno took a selfie of the two women in the Malibu as they traveled to the bachelorette party. The magic moment is now a tragic memento for those she left behind. According to theMissouri Highway Patrol, Theobald faces charges of careless and imprudent driving. Moreno and her fiance, Jesse Arcobasso, 28, had been engaged since last year, according to WPEC-TV. Moreno worked at a doctor's office and was the mother of a 5-year-old boy, whose father reportedly lives in the Kansas City area. "He doesn't quite understand everything just yet," Arcobasso told WPEC of Moreno's son. "I know it's going to take time." Moreno and Arcobasso were to be married next month in Jamaica. Instead, friends and relatives who had helped arrange her wedding are now preparing for her funeral. "Complete shock. It wasn't real," Moreno's mother, Kelly Arie, told KDVR.comMonday, as she recalled hearing the news. "It felt like a messed-up dream and I needed to wake up from it and I just couldn't believe it. I still can't." A website has been created to collect funds to pay for Moreno's funeral and related expenses. Donations can also be made to the Collette Moreno-Arcobasso Memorial Fund at Bank of the West, 229 SE Topaz Dr., Lee's Summit, MO 64063.